(Bloomberg) -- First Mexico’s president told oil drillers to produce more. Now he wants fuel stations to charge less. Mexican President Andres Manuel Lopez Obrador is calling on fuels, liquid petroleum gas, and natural gas distributors to review their profit margins and pass on more tax savings to consumers in his latest crackdown on the private energy market. Mexico offers subsidies for fuel aimed at reducing the amount charged to consumers when international prices rise. Distributors absorb about 63 percent of that aid, Mexico’s deputy finance minister Arturo Herrera said at the president’s morning press conference in Mexico City. If the subsidies don’t keep fuel prices low, “then we would think about creating a group of service stations in the country," Lopez Obrador said. He didn’t specify whether the state-owned oil company Petroleos Mexicanos, which leases out its brand to private franchises in Mexico, would own the new filling stations. The leftist leader swept into power in July elections with a pledge to end gasoline price spikes, known as “gasolinazos,” that saw consumer prices surge 20 percent in some regions in 2017. The price increase was blamed on the energy reforms of the previous center-right government, which opened Mexico’s energy market to private investment and ended the policy of capping fuel prices. While gasoline prices are now set by the market, the Mexican government applies a so-called “fiscal stimulus” that reduces the excise tax on gasoline and diesel, giving it some control over the final price. Mexico’s fuel prices are on the rise this year. Regular gasoline has ticked up 72 centavos a liter between the start of Jan. and the end of Feb., to reach 19.66 pesos a liter ($3.93 per gallon), according to data from the Energy Regulatory Commission. Diesel rose 1.11 pesos a liter over the same period, while premium gasoline fell seven centavos. Long-term declines in Mexico’s oil production have seen domestic fuels increasingly replaced by imports, which now account for about three-fourths of gasoline sales in Mexico. At the same time that Mexico is being forced to import more fuel, it doesn’t have sufficient infrastructure to store and transport it. Infrastructure bottlenecks have raised prices as more fuel must be transported by truck than less expensive modes of transport such as pipeline and rail. Mexicans have been paying more for their fuel than their northern neighbors for some time. 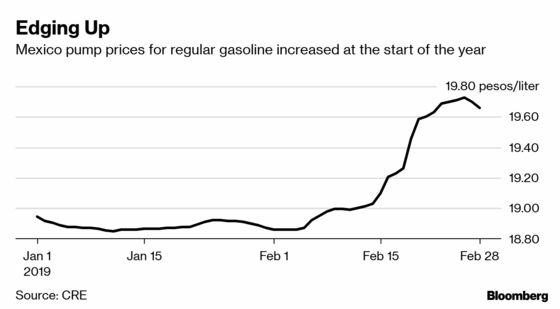 Ahead of Lopez Obrador’s election last year, Mexico’s gasoline prices increased more than 60 percent in six years, even as the U.S. saw prices fall by more than a third due to the shale boom.